Taoiseach Leo Varadkar said a hard border could "involve people in uniform... possibly a police presence, or an army presence to back it up". Mr Varadkar added that Ireland had been "victimised" by the Brexit process. "The taoiseach made it clear in the interview that the government is determined to avoid a no deal scenario and the consequent risk of a hard border," the spokesperson said. "He was asked to describe a hard border, and gave a description of what it used to look like, and the risk of what it could look like in the worst case scenario. The comments come as the UK chancellor said the EU could be ready to drop some of its Brexit "red lines" to "help" save the deal it reached with the UK. What would no-deal mean for NI economy? How is Ireland preparing for a no-deal? Prime Minister Theresa May is battling to get her withdrawal deal through Parliament. Many oppose the deal because of its insistence on a backstop for the Irish border. The backstop is effectively an insurance policy to avoid a return to a hard border between Northern Ireland and the Republic of Ireland, if no other solution can be found through a wider trade deal with the EU. However, the DUP's deputy leader Nigel Dodds called the backstop a "trap", saying there were alternative ways to resolve the border issue, although there was a "need to see a willingness to explore such options". 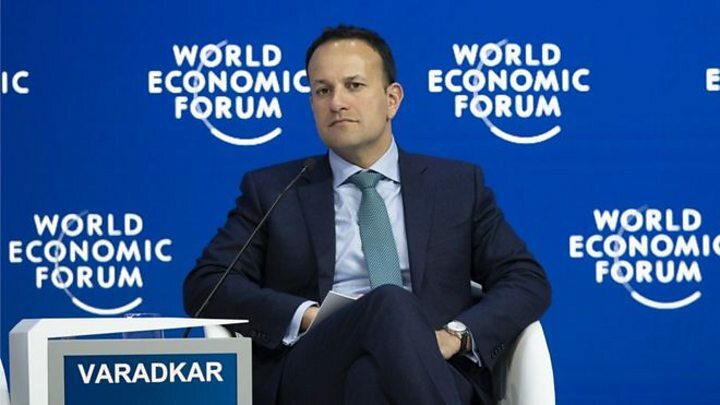 Speaking to Bloomberg TV at the World Economic Forum in Davos, Mr Varadkar said the backstop was needed to stop the enforcement of visible border between Northern Ireland and the Republic of Ireland. At present, goods and services are traded between the two jurisdictions on the island of Ireland with few restrictions. This was secured in the 1998 Good Friday Agreement, which was signed by both the Irish and British governments, as well as political parties in Northern Ireland. Mr Varadkar said the onus was on London to find a solution, adding that Dublin had constantly been asked to compromise on a number of issues. DUP MP Gregory Campbell called the taoiseach's comments about a worst-case scenario as "deeply unhelpful". "Whilst others focus on trying to move towards a sensible deal, the Irish prime minister needs to dial down the rhetoric and focus on more solutions," he added. "Today he paints a doomsday scenario of a return of soldiers to the border in the event of a no-deal Brexit," she said. "If that is the case then the only way to prevent such a scenario is by affording the Irish people their say in the form of a border poll on Irish unity." "The taoiseach made it clear in the interview that the government is determined to avoid a no-deal scenario and the consequent risk of a hard border," the spokesperson said. "He was asked to describe a hard border, and gave a description of what it used to look like, and the risk of what it could look like in the worst-case scenario." On Thursday, Mr Varadkar said the UK would find it "very difficult" to do trade deals after Brexit if it has not resolved the Irish border issue. In Westminster, opponents of the backstop fear it will not just be a temporary measure if no future trade deal is agreed. 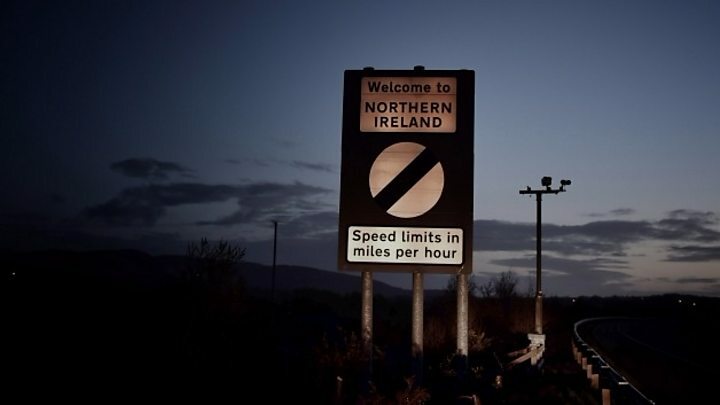 Downing Street says this is one of a range of concerns it is working to address and that it is "not there yet" with a new backstop proposal to take to Brussels. The chancellor, Phillip Hammond said, while he does not believe the EU will scrap the backstop, some in the EU were "looking at what they can do" to change it to help pass the deal through Westminster. Meanwhile, the Central Bank of Ireland has warned a no-deal Brexit could lead to "immense" challenges for the Irish economy. In its first quarterly report of the year, it stated that the economy could grow by about 4.5% this year, but that may fall to 1.5% in a no-deal scenario. 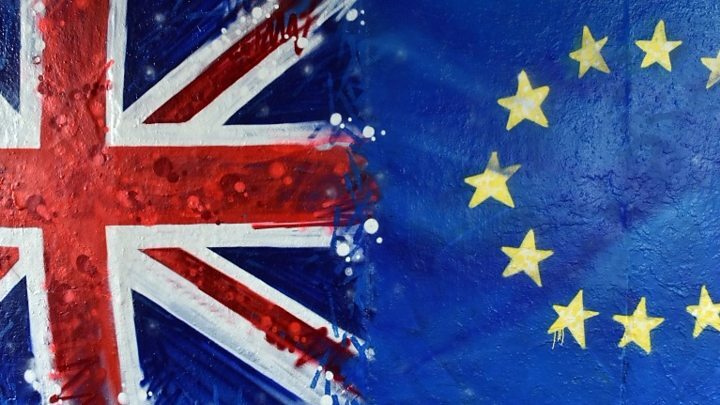 "Overall, compared to a scenario where the UK remained an EU member, a disorderly Brexit would result in a substantial and permanent loss of output in the Irish economy," the report said. "The disruption and related decline in economic activity would be front-loaded and would mean a significantly more adverse outlook for the Irish economy in 2019 and 2020, compared to the central forecasts in this bulletin." The Central Bank's report suggests that a "disorderly Brexit" would reduce growth in the Irish economy for the next two years. The Central Bank of Ireland uses 88p to the euro as its sterling figure, but says this could slide to 96p-97p in a no-deal Brexit. It warned that the "deterioration in economic conditions and a more adverse outlook would cause firms and households to cut spending". It said imports would be affected due to disruption of production processes, and that households would also be affected through the price and availability of consumer goods. "Exports would fall due to an immediate demand and large reduction in demand from the UK and the fall in sterling."